This is possibly the biggest and best gift you could give yourself, and actually your family and loved ones as well. You will change on a deep and meaningful level, and begin the transformation into the person you were meant to be. The truths are these: you do deserve it and taking this time to care for yourself will equip you to be present and truly see and love the people in your life when you return. You already know the other women going, you just haven't met them yet. Within a few hours you will feel so comfortable talking and listening to them that you'll feel as though you've known them for ever. You'll make some deep connections with beautiful souls who will continue to touch and bless your life after you leave. You will laugh and cry and talk and write and dance and draw and breathe and heal and grow and be nourished and loved. But the most important truth is this: encircled by this group of women you will catch a glimpse of yourself as the woman they see (instead of the woman your inner critic tells you you are) and you will like her, you will want to see more of her. And when you get home and the laughter has faded, and the sand is shaken out of your shoes, you will make time for her. Maybe not every day, but she will stay with you forever. I first met Liz back in the fall of 2009. It was at her first retreat called Unearth. I went by myself. I came back life changed. Not only because of the people who showed up, but also because of the raw sense of purpose my art started to take on. I began to see differently. I slowed down to noticed the nuances of nature. I met people who showed their vulnerability and embraced mine. I could begin to feel free to be myself. I was given the gift of sisterhood. Liz being the conduit. I cried without really knowing why. I guess its because the folks, that Liz attracted to this magical setting on the beach, embraced me with love and friendship. Its hard to describe the feeling..... when you tell someone you love them and you've only just met them. But that's what is being fostered here in that space. Indescribable moments. Pure magical moments that continue their outward ripple to other souls. The above article that was in the first issue of Mingle magazine. It is written by Jenna McGuiggan, and she beautifully captures the feel of these retreats. The photos taken by Vivienne McMaster and Kate Inglis are gorgeous! all i can say is...if you can ever find a way to experience something like this...you must do it! i walked into this feeling more of the emotion fear than anything else... and walked out feeling as if i could burst from all the love i experienced over the course of 4 days. it absolutely, positively was a life changing experience. it was truly the unexpected! i carry these women with me now...they are a part of who i am. they have made me better for knowing each and every one of them. they gave me confidence i didn't know that i had. they gave me more love than i could have imagined. they gave me a nudge to really open up my creative side and explore away. they gave me safety and acceptance of who kolleen really is. 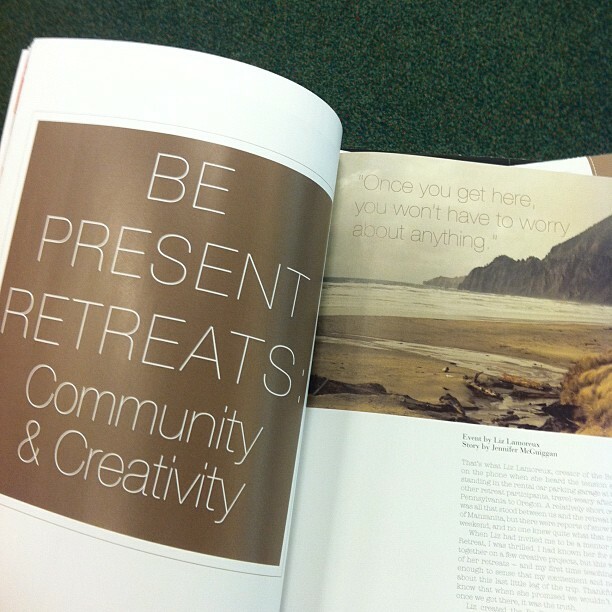 i thought the be present retreat would be fun (i do like painting and yoga and photography). what i did not realize is that it would be incredible, magical, and life-changing. do you know how everything can be the same and yet be completely different? that is how i feel right now. outwardly, nothing has changed. inwardly, i will never be the same again. my heart is so full it is bursting - and i have 24 amazing and inspiring women to thank for that.